I was a little disappointed that the off-white was a bit more so than the picture indicated on my computer. It didn't quite work with the quilt I had. 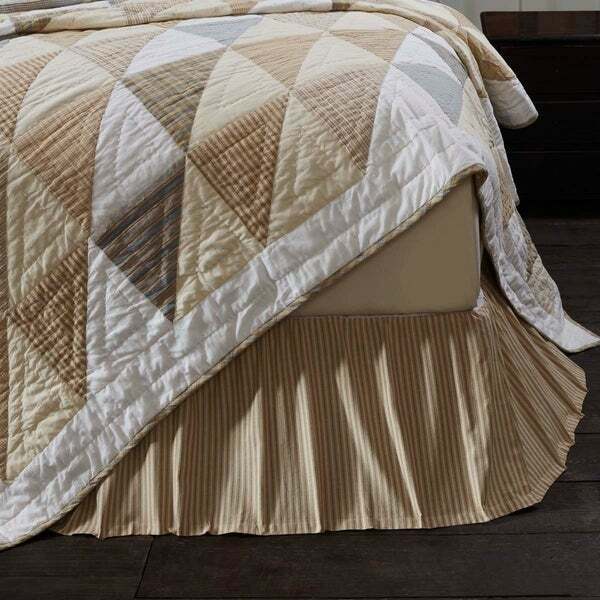 However, the bed skirt itself is an excellent quality and I plan to keep it for another comforter. I think it is a great value for the price. Very happy with the purchase even though things didn't work out as originally planned. Nice bed skirt. Color is true to picture, fabric is soft and the wrinkles ironed right out after I washed it. It is a bit long on our low profile box spring, I may have to hem it up a bit. Wasn't sure if it would match the quilt on our cabin bed, but it is almost a perfect match. A little eclectic, just like I like it. And now the cat can hide under it when the grandkids are too rambunctious. Gorgeous Bed Skirt. Complements the matching quilt and pillows. I'm sure this would have looked great on the bed with the matching quilt, but both smelled so badly, I returned them immediately.